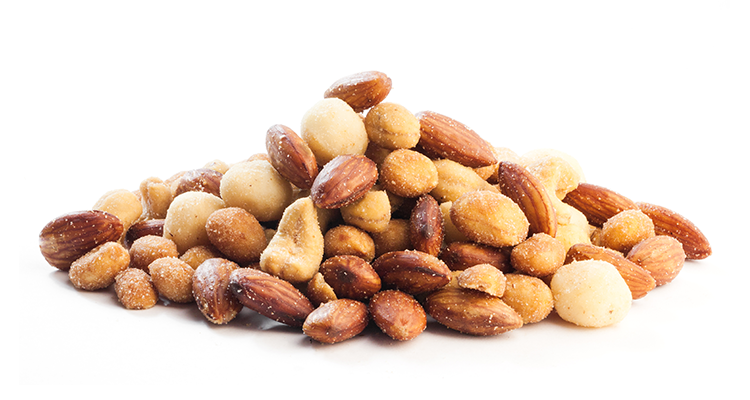 A selection of your favourite nuts with a delicious honey flavour – yum! Honey Roast Peanuts (Peanuts, Sugar, Honey (2%), Vegetable Oil (Peanut, Soybean), Salt, Modified Starch (Potato), Maltodextrin, Stabiliser (415)), Roasted Almonds (Almonds, Sunflower Oil), Honey Roast Cashews (Cashews, Sugar, Honey (1.5%), Salt, Wheat Starch, Emulsifier (Soy Lecithin), Maltodextrin, Lactose, Vegetable Gum (414), Sunflower Oil), Macadamia Nuts, Salt. Contains gluten, peanuts, milk, soy and tree nuts. May contain traces of egg, sesame seeds, sulphites and other tree nuts.